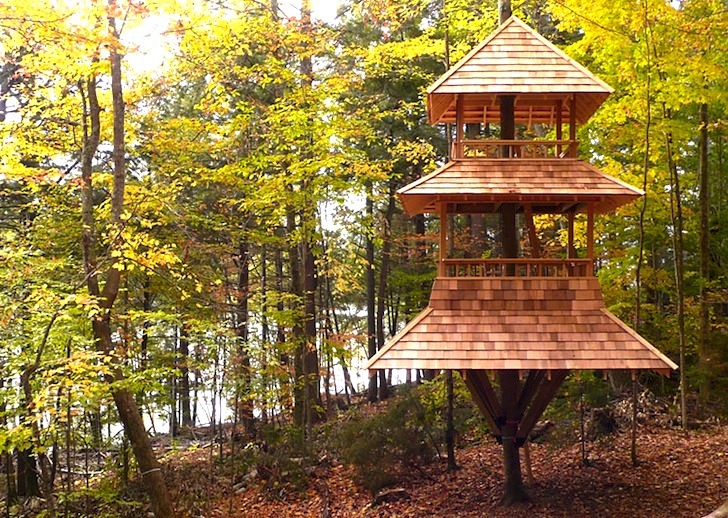 We’ve seen our fair share of eye-catching treehouses at Inhabitat, but this beautiful tiered treehouse in upstate New York really stands out from the pack. Designed by Swedish builder Nils Luderowski of Luderowski Architect, the gorgeous pyramidal treehouse was built with intricate craftsmanship evocative of Japan’s elegant pagoda architecture. Located in the town of Long Lake, the two-story Reinhold Treehouse wraps around the trunk of a single broad-leafed tree piercing through the center of the structure. Crafted with light, honey-colored wooden beams, the Reinhold Treehouse stands out against the dark-colored bark of its supporting tree and almost appears to float above the forest floor. The treehouse was designed in the “New Adirondack Style,” a technique fathered by Luderowski that mixes Japanese influences with a rugged simplicity with natural materials. The structure’s latticework of overlapping beams and joists is visible from the forest floor and creates a beautiful and complex texture that contrasts with the translucent tree canopy. A ladder inconspicuously drops down from the center of the base to give the owners access into the treehouse. A simple handrail wraps around the four sides of each floor. This gorgeous pyramidal treehouse was built with intricate craftsmanship evocative of Japan's elegant pagoda architecture. Built with light, honey-colored wooden beams, the Reinhold Treehouse stands out against the dark colored bark of its supporting tree and almost appears to float above the forest floor. The treehouse was designed in the "New Adirondack Style," a technique fathered by Luderowski that mixes Japanese influences with a rugged simplicity with natural materials. A ladder inconspicuously drops down from the center of the base to give the owners access into the treehouse. The latticework of overlapping beams and joists is visible from the forest floor and creates a beautiful and complex texture that contrasts with the translucent tree canopy.